Cayenne is both a spicy food additive and natural medicinal supplement derived from the red pepper, or Capsicum annuum. The active ingredient in cayenne is capsaicin, which may be used as an herbal treatment to alleviate pain and inflammation. If you have questions or concerns regarding how much cayenne pepper you should take each day, consult your primary medical provider. As an adult, you may take between 30 and 120 mg of cayenne pepper in capsule form up to three times each day, according to the University of Maryland Medical Center. Orally administered forms of cayenne are typically used to reduce inflammation along your digestive tract. You should be aware, however, that cayenne pepper capsules may cause stomach irritation if used excessively or improperly. You may also take cayenne pepper in tincture form. A tincture is a liquid extract derived from a specific plant and typically contains between 25 to 60 percent ethanol, or alcohol. Adults may take 0.3 to 1 ml of cayenne tincture up to three times each day, the University of Michigan Health System reports. Treatment with a cayenne tincture may cause mild burning of your mouth or throat, watery eyes or nasal congestion. An infusion is a treatment prepared by allowing an herb to soak in hot water. To prepare a cayenne infusion, pour 1 cup of boiling water onto 0.5 to 1 tsp. of cayenne powder. Allow this mixture to sit for 10 minutes. You may take 1 tsp. of this cayenne infusion three to four times each day. If you want to dilute the taste of the infusion, mix your 1 tsp. dose with a small amount of water before taking it. Like a cayenne tincture, a cayenne infusion may also cause mild oral burning, runny nose or watery eyes. Topical preparations of cayenne pepper are also available. Typically, capsaicin cream or ointment contains 0.025 to 0.075 percent capsaicin. Children older than age 2 may use topical cayenne cream for no longer than 2 consecutive days, unless otherwise instructed by a medical professional. Adults may apply cayenne cream up to four times each day. Topical cayenne ointment may cause mild and temporary burning, itching or irritation across the site of application. Inform your medical provider of any health problems or concerns you have before taking cayenne pepper supplements. 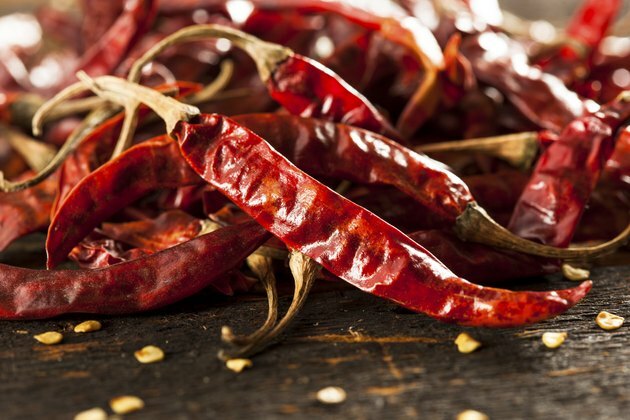 If you're allergic to kiwi, latex, bananas, avocado or chestnuts, avoid treatment with cayenne. Such allergies may indicate that you are also allergic to this herb. If you have a personal history of stomach ulcers or heartburn, consult your doctor before using cayenne. Cayenne pepper supplements should not be used during pregnancy or breastfeeding.